2-Island Race 2019 – breaking records… and other things. It takes a good blow to find out what needs replacing on the boat, but one should never have to find out under such circumstances. Ashley Barne’s Defiance experienced a variation of Murphy’s Law during yesterday’s 2-Island Race, breaking nearly everything possible on the boat before being forced to retire. 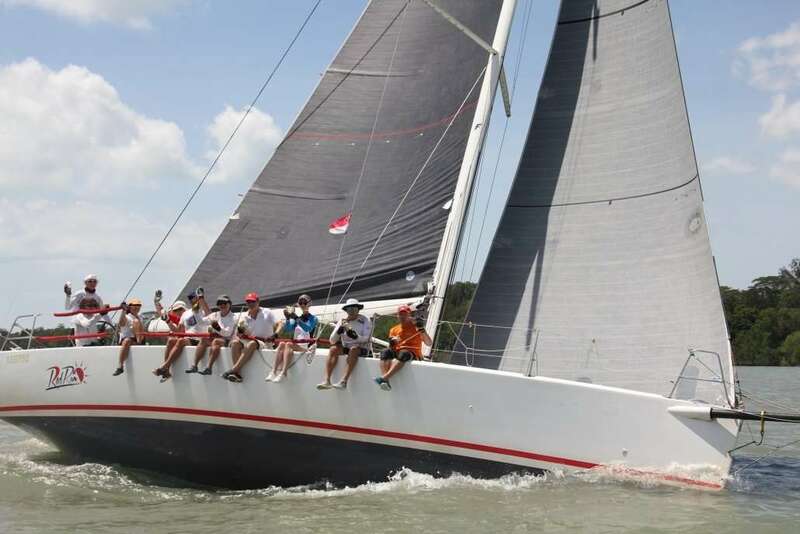 Displaying a star-studded crew of ex and current Asian GP Circuit Winners onboard, Defiance was looking to better her 2018’s timing of 5hrs 1min 6sec taken to circumnavigate Tekong & Ubin. Alas, a bad start, torn genoa, torn spinnaker, broken clew amongst other things eventually forced the mighty Defiance to surrender the race and retire back to the moorings. 2 more retirements plagued the PY fleet, as Brio gave up the fight halfway – and newcomers Nifty Flapper struggled against the strong outgoing tide late into the evening, getting escorted by one of our safety boats back to the club. Temptress of Down holds the 2018 PY record for fastest keelboat, and was also looking to beat her PB of 4hr 52min 48sec. This year, she once again took PY line honours, smashing the record by 3mins & 2 secs! She earns herself a well-deserved 2nd place after corrected time, trailing by about 2mins behind winners Sangaree. Minx returns to her winning ways with a solid performance – completing the podium in 3rd. The PY class continues to grow, with an outstanding turnout of 13 boats! We are excited to see more boat owners joining us for our weekend races (e.g. Nifty Flapper, Emmanuel II & Zoo Too) – hope you enjoyed the champagne sailing conditions! In the IRC Class, it was a close battle between 5 performance cruisers, with Steve Manning/Paul O’Malley’s Red Rum leading the pack for most of the passage. Despite also beating her previous record by about 3 minutes and her comfortable lead over the chasing fleet, she fails to triumph on handicap, settling for 5th. A good start was probably the only thing that went right for Born in Fire, as she struggled to keep up with the front runners after an early halyard malfunction, costing her valuable time and a position on the podium. First place went to Paul Kendall’s Jong Dee, scoring a victory by a slim 1min 38 secs margin ahead of Joe Lombardo’s Shardana on corrected time. third place went to the 2018 defending champions, husband & wife combination of Kurt & Gill on Waka Tere – sailing superbly to their non-spin TCC to secure 2nd runner up. Records continue to be broken in the remaining classes, as Tim Hill’s Cicak eclipsed Phoenix’s 2018 timing by a whole 10 minutes, taking line honours and handicap victory in style. Eeepai trailed about 6 minutes behind to take 1st runner-up, followed by Witblits in 3rd. David Stanton’s M23 Baloo struggled to gain any ground throughout the race, finding it difficult to grasp the strong tides on the first leg and patchy winds behind the islands. The fastest boat in the Beach Catamaran Fleet came back in a ridiculously quick time of 3hr 26min 40sec, with Scott McCook’s Carbon F20 returning to shore before the tide turned. He smashes the previous record 3hr 30min 35sec set by Madfish II, but still had to settle for 3rd on the podium after handicap. 2nd place was awarded to Madfish II, as she surrendered her title to the newly crowned 2019 champion Stray Catz! We’re really stoked to see 27 boats taking part yesterday – thank you all for enjoying the race with us. As we finished racing late into the evening yesterday, prize presentation for the 2-Island Race will take place together with the Commodore’s Cup presentation on the evening of 3rd March. Looking forward to another exhilarating weekend of racing at the CSC Commodore’s Cup next week – please send in you forms this week to facilitate administration and logistics, thanks again!